​The Threat Assessment Map (or T.A.M.) 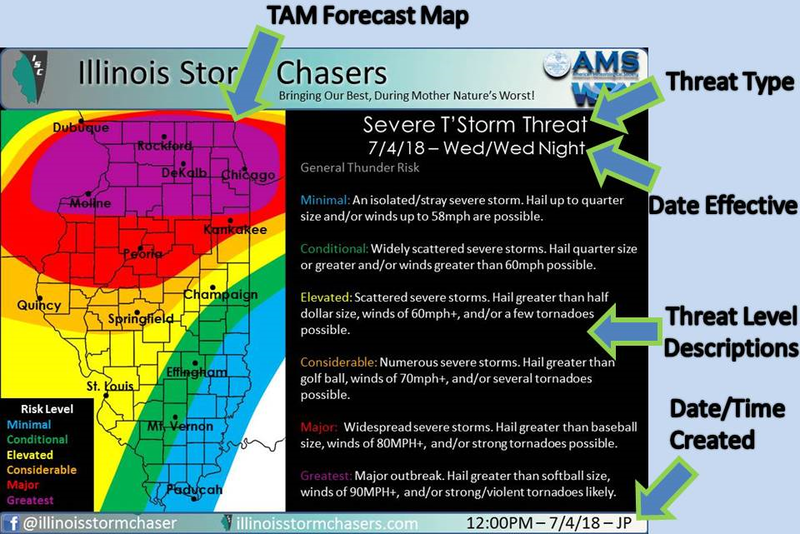 was developed by Danny Neal of Illinois Storm Chasers LLC. in 2017 as a county by county look at threats from severe, winter, and/or unusual weather. The T.A.M. is in no way connected to NOAA, the National Weather Service, or any other private or local media service. It is a way that Illinois Storm Chasers LLC. can convey their forecast using an easy to understand graphic for all of their users. The T.A.M. will be updated at least once a day, every day hazardous weather is expected. Our T.A.M. product will cover ten main categories: thunderstorm threat, tornado threat, severe thunderstorm threat, heavy rain/flooding threat, extreme heat threat, extreme cold threat, strong wind threat, snow threat and ice threat across the Land of Lincoln.